The Mask Wearer by Bryan Pero. An Amos Daragon Fantasy. 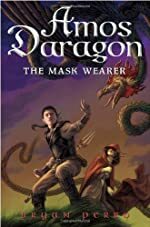 Review: Adventure, excitement, and dedication are the three words that describe Amos Daragon: The Mask Wearer. The Mask Wearer is the first book in the Amos Daragon series. The main character is Amos Daragon and he is an intelligent boy who has outsmarted two lords/kings. The author of this book is Bryan Perro. Amos Daragon was just a farm boy whose parents have lived under Lord Ednof's rule. Amos has helped his family survive by bringing them the food he hunts. His parents work under Ednof's rule so they pay their debt by working hard. Then one day when Amos is off doing his daily work to collect food, he ends up into talking to a mermaid who asks Amos to deliver a message to her friends. So he sets off on his journey where he faces many dangers and makes new friends. Along the way, he ends up saving guy's childhood which had been taken away. He also, fools a King and plays smart with an innkeeper and a leader. I really appreciated Amos Daragon: The Mask Wearer. The characters are funny and smart. The main character even outsmarts a few people. Also, in the story there are mythical creatures from various early cultures like the Greek, Irish, Egyptian, the Middle Eastern and Europe. There was a lot of adventure and action. One example is a small battle at the end. There was a lot of suspense when medusa set off to trick the Mask wear. The character became more heroic at the end of Amos Daragon: The Mask Wearer. I admired the book very much. We would like to thank Random House for providing a copy of The Mask Wearer for this review. Have you read The Mask Wearer? How would you rate it?